Thanksgiving is arguably one of America’s favorite holidays. It is a special time, not only for giving thanks, but for bringing families together. It also happens to take place during National Adoption Awareness Month. Turkey Day is the perfect time for everyone touched by adoption to celebrate and honor their choice. Here are some simple ideas for adoptive families and birth parents this holiday. Just before digging into some turkey and mashed potatoes, go around the table and share what you are most thankful for. This is a great opportunity for adoptive parents to express thanks for their child’s birth parents, for helping to form their family. Children can benefit from hearing positive dialogue about their birth parents and adoption story. It is also a great reminder for birth mothers, who can reflect on their selfless choice and find peace of mind in knowing their child is being raised and loved by good people. Here is a more creative twist to this round table discussion of thanks: Write down what you are thankful for. Buy a light-colored tablecloth and some wash-resistant pens. Each year, you and your loved ones can jot down what you are grateful for, while looking back on the notes from years past. Think of it as your Thanksgiving yearbook, that you build upon each Thanksgiving holiday. Here is a great twist to sharing what you are thankful for. It does involve a bit more planning, but it is a simple and creative tool for getting the message of gratitude across. With this method, use empty jars designated for each guest at your Thanksgiving celebration. The jars may be decorated by family members or simply left plain. Ask everyone to write, on a small piece of paper, why they are thankful for each person and place it in the individual’s jar. Each guest takes home a gift of positive affirmations. This is the perfect Thanksgiving tradition for the crafty family. Have the children find a leafless tree branch from the backyard and place it in a vase on the family table. Cut out leaves from colored construction paper and have each guest write what they are thankful for on a leaf. Attach the leaves to the tree using colorful ribbon for a personal – and festive – decoration. It goes without saying that photography is one of the best ways to capture precious family memories. Adoptive families should make it a point to take pictures together on Thanksgiving Day. Gather in front of the same backdrop each year, perhaps holding the same item. The item could be something particularly sentimental, such as a gift from the birth mother. It could also be in the same clothing or matching outfits. This is a fun tradition to enjoy each year, and it is extra special to look back on family photos of Thanksgiving through the years, to see how you all have grown as a family. Here is another creative activity for the whole adoptive family to enjoy. Make a memory or scrapbook page decorated with family photos taken on Thanksgiving and notes mentioning what each guest voiced as their greatest blessing. Both kids and parents alike will enjoy looking at this over the years. Families involved in an open adoption can get the birth parents involved in the annual photo fun, too. If you have an open adoption or semi-open adoption arrangement, consider sending the pictures to the birth parents, with a letter of gratitude and an update on life each year. Adoptive families could also send annual photos and updates to their adoption agency, like Adoptions With Love. Our staff loves to get updates and watch families grow! We also keep letters and photos on file, in case a birth mother does not have direct contact with the adoptive family but wishes to see photos or read letters down the road. 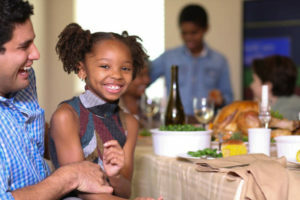 In addition to giving thanks, adoptive families can consider giving back on Thanksgiving. Mentor a couple looking to adopt, or meet with a family currently going through the adoption process. You have been there. You know what it is like. Share your experience and offer any tips for going through the journey with a positive and patient outlook, especially for those waiting to adopt this holiday season. Birth mothers can also give back this giving season, by helping other women who are facing an unplanned pregnancy or going through the adoption process. Sometimes, there is no greater support than the kind that comes from others who have walked in similar shoes – who understand what it feels like to make an adoption plan first-hand, and who can relate to them on a personal level during this emotional time. Families waiting to adopt do not need to wait to start their thankful displays. Write a letter to your future child and have family members do the same. Jot down your hopes and dreams for your child’s future. You could even include the traditions you would like to have for Thanksgiving with your child. This is a fun exercise to help build excitement and positivity for the future adoption. Just like the annual photos or tablecloth of thanks, the letters will also be fun memento to look back on for the many years to come. Thanksgiving is all about gratitude. It is the perfect chance for families of all kinds – adoptive, birth, blended, foster – to take a step back and reflect on all of their blessings. However you decide to celebrate National Adoption Month and Thanksgiving, savor that family time – and some extra turkey! Adoptions With Love has even more helpful resources for our birth parents and adoptive families. Reach out to us anytime, day or night, for assistance in the Massachusetts adoption process.